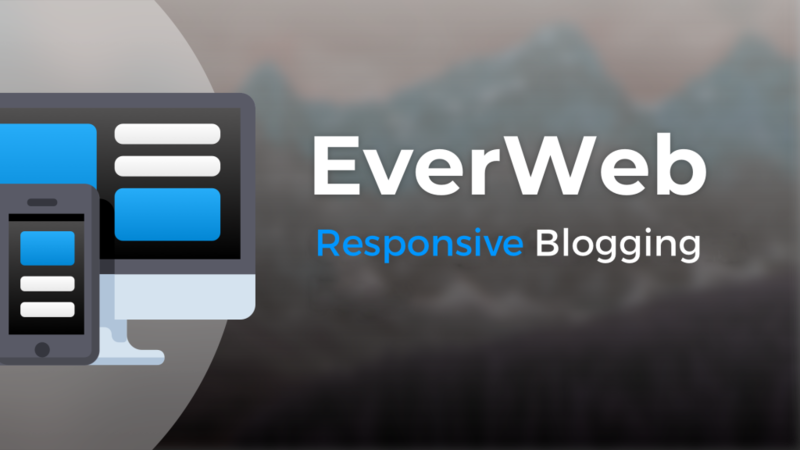 The previous blog posts in this series have explained in detail how to prepare and build a responsive website in EverWeb, adding a blog to your responsive website and how to convert an existing fixed width website in to a responsive one. When developing a responsive website, one crucial element you must bear in mind at all times is the testing of your page design. One of the most difficult development tasks is making sure that the responsive page you have created looks great on any device, from mobile to wide desktop and everything else in between. Fortunately, EverWeb takes most of the hard work out of this process as the responsive page layout scales appropriately for all browser widths. From a design perspective you will still need to check that the page has the correct margins at any browser width, that objects on the page are always spaced appropriately, both horizontally and vertically and that images and other media display consistently at all times. Margins: You can set the left and right margins of a full width object in the Metrics Inspector. In EverWeb version 2.9 you can also set the maximum width of a full width object so that it does not appear too strung out on desktop or wide desktop devices. For a Responsive Row widget, look for the ‘Content Maximum Width’ setting is in its Widget Settings. Padding Options: Many of EverWeb’s widgets include padding options that help space objects so that they display better in relation to other objects on any browser. Remember that Padding options usually add vertical and horizontal spacing to the selected object. Hidden Objects: EverWeb 2.9 recently introduced a new feature where you can hide objects so that they only display when you want them to. The ‘Show on Device’ option is available in the Metrics Inspector. Use the View menu to Show or Hide Hidden Objects on the page and secondary click in the Editor Window to quickly select any hidden object on the page using the ‘Hidden Objects’ menu option. Breakpoints: You can override EverWeb’s own default page breakpoints and define your own instead. The Breakpoints options can be found below Show on Device in the Metrics Inspector. Editor Window: You can always quickly see how your page will look at any browser width by reducing the width of the right hand side of the EverWeb app itself. As you do this, the Editor Window will automatically adjust giving you an idea of how the page scales. You can also use the Window-> Presentation Mode (or Cmd+period key) menu option toggle to hide the EverWeb User Interface if you want. remember when using Presentation Mode that you are still viewing the page in the Editor Window so the page can still be edited. Although you can quickly see how your page will look using the above mentioned options in EverWeb, it is usually better to Preview your site before publishing so that the page can be tested in different browsers. Some browsers include responsive options so you can test how your page will look on various device types or browser widths. Apple’s Safari browser, for example, offers a Responsive Design Mode so you can see how your page will look on an iPhone SE, iPhone 8 and 8 Plus, iPad and Mac computer. To use Safari’s Responsive mode go to the Safari-> Preferences menu. Click on the Advanced tab and check the box ‘Show Develop menu in menu bar’. The ‘Developer’ menu will appear in Safari’s navigation menu bar. To use the responsive mode, select Develop-> Enter Responsive Design Mode. You can view the device you want to view the page on in either portrait or landscape mode. Just click on the iPhone or iPad icon at the top of the widow to toggle the view. Apple also offers the Simulator app as part of its Xcode app. You can download Xcode if you have signed up to access Apples Developer Program but bear in mind that the download is about 4.5GB. The Xcode app is free of charge to set up. Once you have downloaded Xcode you can install Simulator on your hard disk. Simulator does exactly that, it simulates Apple hardware environments such as Apple Watch, iPhone, iPad, MacBook Pro etc. For the purposes of testing your website, Simulator is probably overkill unless you are an app developer. Using Responsive options provided natively by web browser software is usually the preferable route as it is quicker and easier than using Simulator. Once you have finished testing the pages of your website, hit the Publish button! When finished remember to to test that all the pages work correctly, that all menus, buttons and other links function properly and that other features such as contact forms, shopping carts are also working as they should. If you have any questions or comments about this series, please let us know in the Comments Section, we’re happy to help! 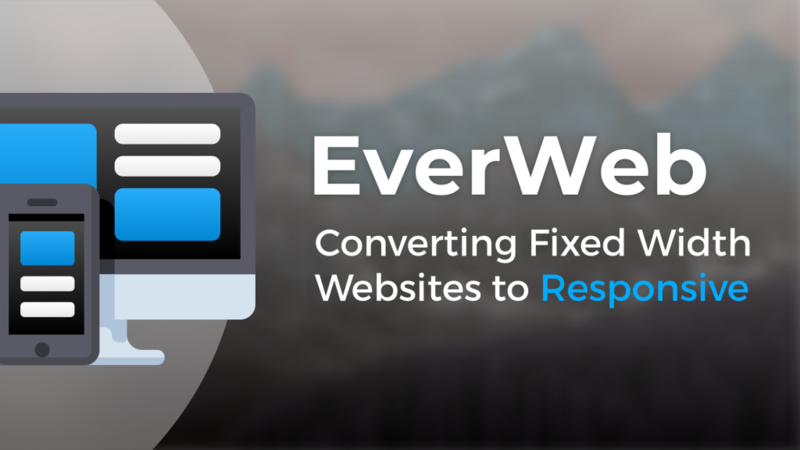 Converting Fixed Width Websites to Responsive! In the previous blog post, we touched upon preparing a fixed width blog in an EverWeb website project for conversion into a responsive blog and what to expect in the process. This post takes the process a step further with an in-depth look at how to quickly and easily convert your whole website from fixed width to responsive. When thinking about moving a website from a fixed width design to a responsive one, perhaps the most important thing to consider is the effect on your website’s overall design. Using a fixed width page layouts makes the distinction between mobile and desktop environments clear as you design a page for each device type. You may even have designed pages specifically for tablets as well. In responsive design, these page designs merge to become one single, scaleable design. You may find that you may need to modify your existing design website to accommodate the new responsive paradigm. The process of reinventing your website as a responsive one will also, perhaps, involve more testing than with a fixed width website.If you change a responsive page design it may have an effect on all device types, not just the device type the change is targeted at. Backup your project file before you start. You should have a backup schedule in place for your computer already, and you should also be using EverWeb’s own project file backup feature as well. Test that you can restore your backup. It is always a good idea to see if your backups are working correctly by restoring from one backup as a test. Even with a backup project file in place it is always best to work from a copy of your project file and set up a test directory to publish to. 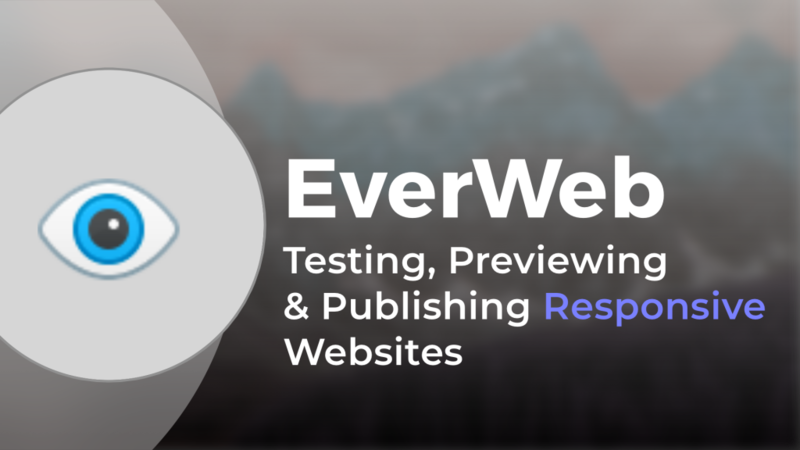 It may be useful to familiarize yourself with EverWeb’s Responsive design features. This will help you to more quickly convert your website as you will know which features and widget to use as you convert objects on the page to the new page layout. Converting a fixed width website into a responsive one is done simply by changing the Page Layout field in the Page Settings tab of the Inspector Window from ‘Centered Layout’ to ‘Responsive’ for each page in the project file. When converting pages, EverWeb will warn you that the change cannot be undone. The reason for this is that the page structures and design methodologies of the page layout styles are fundamentally different from each other. This is why it is best to work from a copy of your project file rather than using the original. To create a duplicate project file, go to the Projects Window and click on the up/down arrows to the right of the project file name in the ‘Recent Projects’ list. Select ‘Duplicate’ from the menu. A duplicate will be created with the same name as the original project file but with ‘Copy’ added at the end. Open the duplicate project and rename it by double clicking on its name in the Web Page List, or by using the File-> Rename Website menu command. When you change the page layout from fixed width to responsive, it may appear that objects are scattered about the page. As a responsive page has no header, any header objects from the fixed width page layout will be placed in the main body of the page instead. You may also find that Footer objects have also been displaced in to the main body area. Headers. Responsive design does not use headers as they are just regarded as full width objects. If you have a header on your fixed width page, move these objects back to the top of the responsive page and make them full width as necessary. Use a Responsive Row widget if you want to keep the objects fixed width. Footers. Responsive web design does include footers so you may need to drag and drop any displaced footer objects back in to the footer area. Remember to hold down the Cmd key when moving objects from the main body area in to the footer. You may also need to use a Responsive Row if you have footer objects that you want to keep as fixed width. Make objects Full Width. Some of the objects on your fixed width page may have been full width. In the converted responsive page, locate such objects e.g. the Navigation Menu widget, and make them full width again by checking the Full Width box in the Metrics Inspector. Drag and drop the full width object to its correct location on the page. TextBoxes, images and many of EverWeb’s widgets can also be made full width in a responsive page. If you prefer to keep some objects fixed width, place them within a Responsive Row widget so that they work properly . Group similar objects together. Objects such as social media icons are often grouped together. You can collect such objects together in a Responsive Row widget. Start by adding a Responsive Row widget to your page and drag it to where you want it on the page. Next, secondary click on one of the social media icons and select ‘Embed In’ and choose the Responsive Row widget you have just placed onto the page. Repeat this process for the remaining social media objects. Use the Responsive Row Widget Settings to for spacing and alignment of the objects within it. Remove any unwanted, unnecessary or redundant objects from the page. Using a responsive page may make some of the objects you have used on the fixed width page redundant. Typically these will be background color shapes and separator lines. When using the Navigation Menu widget, you can use the Widget Settings to add a background color instead of using a shape object. If you have used Picture Frames for images, these will appear separate to the images and should be deleted as they are currently not supported in responsive pages. Use Margins for Full Width objects. You can easily set a left and right margin for a full width object by using the Margin fields in the Metrics Inspector for any full width object. This is easier and more consistent than using padding options within widgets or the Insert Margin option for TextBoxes. Responsive ready widgets. EverWeb 2.8 introduced new widgets that provide great design flexibility when designing pages for your website. The Text Section, Responsive Image Gallery and FlexBox widgets may give you design ideas and solutions when converting pages, for example, you may find it better to place the text from a TextBox in to a FlexBox widget. 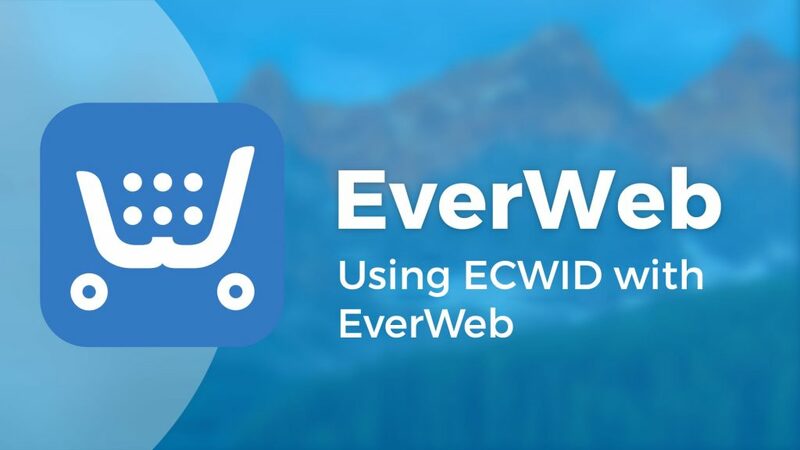 Many of EverWeb’s existing widgets have also been updated in version 2.8 so that they can be used at full width without needing to be placed in a Responsive Row widget. Fixed width objects. There may be objects in your page that you want to keep as fixed width, or only work as fixed width objects (e.g. the PayPal widget). In these cases, embed such objects in to a Responsive Row widget. Turn off mobile redirect on your page. In the Page Settings tab of the page, set Mobile Page to none so that no redirect takes place. This is optional as there may be instances where you do want to redirect when the page is viewed on a mobile device. Testing. As mentioned earlier, this is paramount when using one design for all device types. Any change you make to the page design needs to be tested on all device types. We will cover testing in detail in the next blog post. 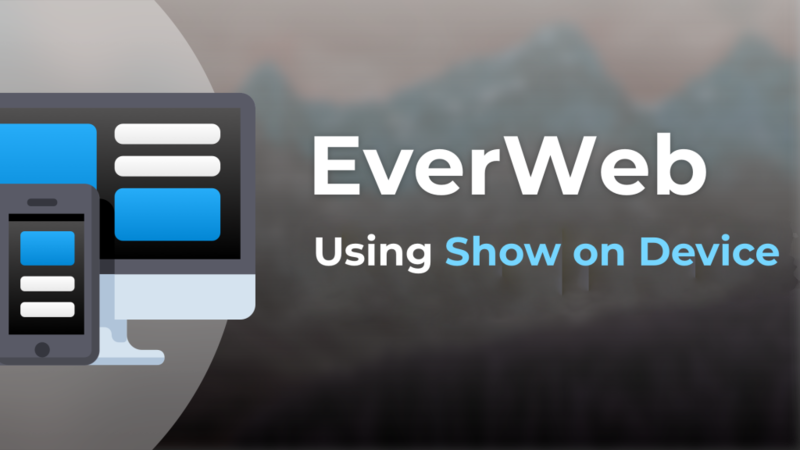 Look out for EverWeb updates! 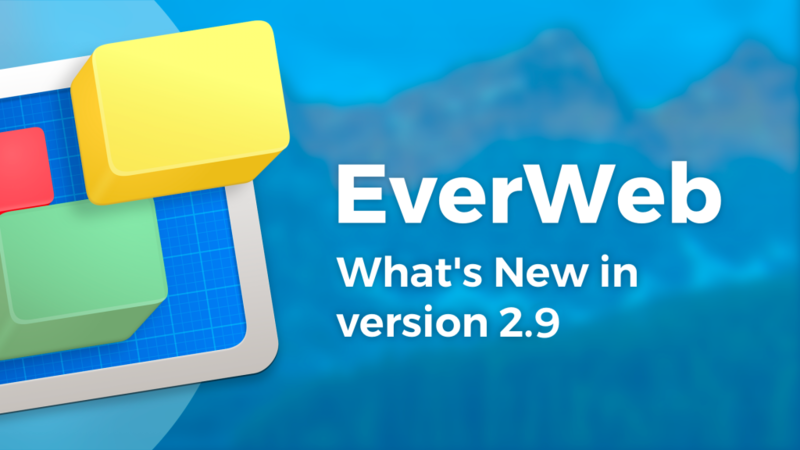 EverWeb 2.9 will add more responsive features to EverWeb. You will be able to select which device an object can appear upon, set a maximum width for full width objects and the Responsive Row widget as as well as being able to set your own breakpoints for mobile, tablet, and desktop devices. In the next blog post, we will look at how to quickly and easily test out your new responsive page design before going live! If you have any questions or comments, please let us know in the Comments section below. We’re happy to help! 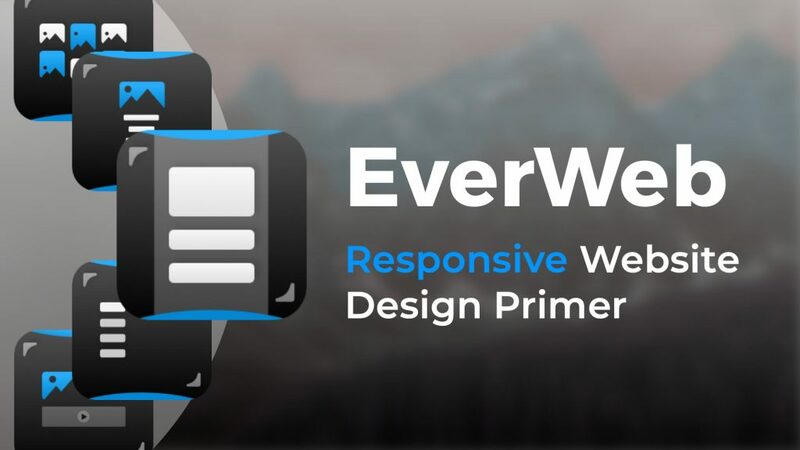 In the blog post ‘EverWeb Responsive Design Primer‘, we explored the background to Responsive Website Design and how it is implemented in EverWeb. In this post, we will create a new responsive website in EverWeb. If you have already created a fixed width website using a Centered or Left-Aligned Page Layout and want to convert it to a Responsive website design, it is best to start a new project file and recreate the existing site from scratch. The Responsive Page Layout uses a different approach to web design than a fixed width design so changing the page layout of an exiting fixed width page to a Responsive page layout is not recommended. If you do want to do this, however, EverWeb will warn you beforehand that changing the page layout cannot be undone. We will cover converting a fixed width site to a Responsive website in detail in a future post. The great thing about building a responsive website in EverWeb is that almost all the features of EverWeb you used in developing fixed width websites still apply, so as usual create a new website project using the ‘Create a new website’ button on EverWeb’s Projects Window. When you create a new website project, the first thing you do is create a new page using the Theme Template Chooser. The Chooser has been enhanced in EverWeb 2.8 so you can filter Theme Templates based on whether you want to see ‘All’ of them or ‘Fixed Width’, ‘New’ or ‘Responsive’ Theme Templates. It is worth exploring some of the over 20 new Responsive Theme Templates to give you a good idea as to how to structure your website’s responsive pages. In addition to filtering, the Theme Template Chooser adds a Responsive blank page to the ‘Blank’ Theme Template a new ‘Blank Responsive’ Theme that includes a blank ‘Home’, ‘Video’, ‘Image Gallery’ and ‘blog’ pages. For the moment, select the ‘Home’ page style of the ‘Blank Responsive’ Theme Template. Now that you have added the first page to the new project, it is worth looking at how the page differs from the Fixed Width ‘Centered’ and ‘Left Aligned’ Page Layouts. In the Page Layout section of Page Settings tab in the Inspector Window, you will see that the Page Layout is set to ‘Responsive’. The ‘Content Width’ and ‘Header Height’ fields are greyed out. As mentioned in the previous post, as responsive web design uses Full Width objects a ‘Content Width’ value is not needed. In the same vein, ‘Header Height’ is also unnecessary as a ‘header’ is just like any other Full Width object on the page. Although there is no header, there is a Footer to provide an ‘end’ section to the page. Scroll down the page to the Footer. You will see that it contains a ‘Responsive Row’ within which is the ‘Made with Love with EverWeb’ image file. The ‘Responsive Row’ is, in fact, a Responsive Row widget. Click in an area of empty space in the Responsive Row widget then go to the Widget Settings button. Here you can change the ‘Responsive Row Name’ from the default ‘Responsive Row’ to something more relevant such as ‘Page Footer’. The Responsive Row naming shown in the Editor Window is useful when you have many Responsive Row widgets on the page. The Responsive Row widget is special as it acts a a ‘super container’ that can hold non-full width objects. If you have objects that you do not want to be full width e.g. TextBoxes, shapes or in this example, the ‘Made with Love with EverWeb’ image file, add a Responsive Row widget to the page, then with the widget still selected use the Toolbar to add a TextBox, or Shape, or drag and drop an image file from an external source or the Assets List on the Responsive Row widget. You can even drag and drop other widgets on to the Responsive Row widget. This is useful when you need to use non-full width widgets such as the PayPal, Live Photo and Facebook widgets. Use the Widget Settings to adjust the spacing and justification of the objects within the Responsive Row widget. For more information on the Responsive Row widget, click on the Help ‘?’ in the top right hand corner of the Responsive Row Widget Settings or check out our Responsive Row Widget YouTube video. The video will take you though how to fully use the widget. The Responsive Row widget is a good example a full width object in responsive design. Most objects that you add to your Responsive Page Layout are designed to be full width. Many of EverWeb’s existing widgets have been updated in version 2.8 to be full width capable. When a widget is not full width capable, EverWeb will advise that you can add such an object by placing it in a Responsive Row widget. Whilst the Responsive Row widget is incredibly useful, the new FlexBox, Responsive Image Gallery Widget and Text Sections widgets have great features and scope. And remember that most widgets do not need to be enclosed inside a Responsive Row widget, unless you have a specific need to do so. Start building the page by adding a Navigation Menu widget. First, click in the main body area of the page so that the Responsive Row widget in the Footer is no longer selected. Next, drag and drop the Navigation Menu widget on to the Editor Window. When the widget is added, it is placed right at the top of the page as a full width object. Style the widget in the same manner as you have always done in EverWeb. Next drag and drop an Image Slider widget on to the page. When added, the widget sits as a full width object immediately beneath the Navigation Menu widget. Add some images in to the Slider, again in the same way as you always use the Image Slider. Now add a TextBox to the page using the Toolbar. Again it is added as a full width object, directly under the last added object – the Image Slider widget. Edit and style the text as you want in the same way usual. Remember that if you do not want the TextBox to be full width, add a Responsive Row widget first then add the TextBox whilst the Responsive Row widget is still selected. In this example, I have already added a TextBox, but not to worry. I can add a Responsive Row widget to the page which will be added immediately below the TextBox. Click back inside the TextBox to select it, then secondary click. In the menu that appears, scroll down to ‘Pick Layer’. You will notice that your TextBox has a checkmark against it as it is already selected. Further down the menu is the option ‘Embed In’. This option is used to to embed objects, such as the the TextBox, in to a Responsive Row widget. You will see the two Responsive Rows on the page listed: ‘Responsive Row 1’ and ‘Page Footer’. Click on ‘Responsive Row 1’. The TextBox is now added to the Responsive Row widget. Go to the Metrics Inspector and uncheck the ‘Full Width’ checkbox and then use the TextBox’s selection handles to change its width so that it no longer full width. You have now created the basic of your first responsive page by adding and manipulating full and non-full width objects. There are many ways you can manipulate objects on the page and we will look at this in the next instalment! 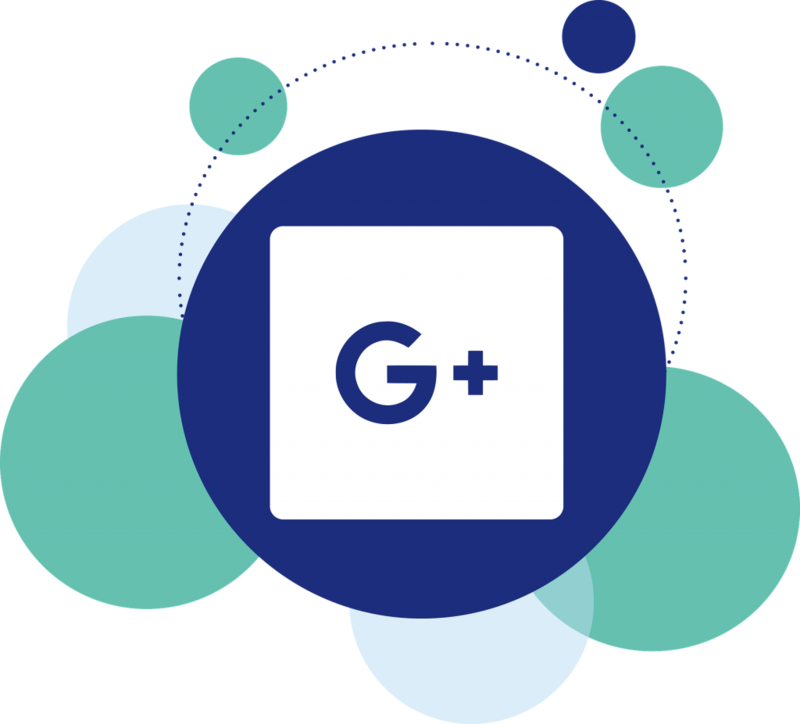 If you have a question, please let us know in the Comments Section below. Thanks!